The Mielec Route begins near the railway station and the new bus station (in Głowackiego street). The housing estate of the PZL plant is our first site to see. Until 1957 – when the title to the estate was transferred by the WSK Mielec company to the town – its streets had had no names. From 1938 to 1939, only today’s Niepodległości avenue had a patron – Andrzej Kędzior (its former names: Cyranowska street, Orla street, and then – just before World War II – Andrzeja Kędziora street; after the war: 22-go Lipca street). That street was the main axis of the Modernist layout of the whole estate. On foot – total walking time: 40 min. By bike – total riding time: 11 min. In Mielec, the residential buildings constructed until World War II have not retained their original characteristics, as both interiors and elevations have been renovated and modernized. However, the villa of the general director of the PZL Airframe Plant has been nearly restored to its original state. The pre-war blocks of flats can be seen at 2, 4, 5 and 6 Kochanowskiego street (for ordinary workers), at 1 and 3 Kochanowskiego street (for foremen), at 1, 2, 3 and 4 Asnyka street and 4 Fredry street (for ordinary workers), at 20 and 22 Niepodległości street (for office workers), at 1 Czarneckiego street and 6 Skłodowskiej-Curie street (for engineers) and at 8 Skłodowskiej-Curie street (for department managers). 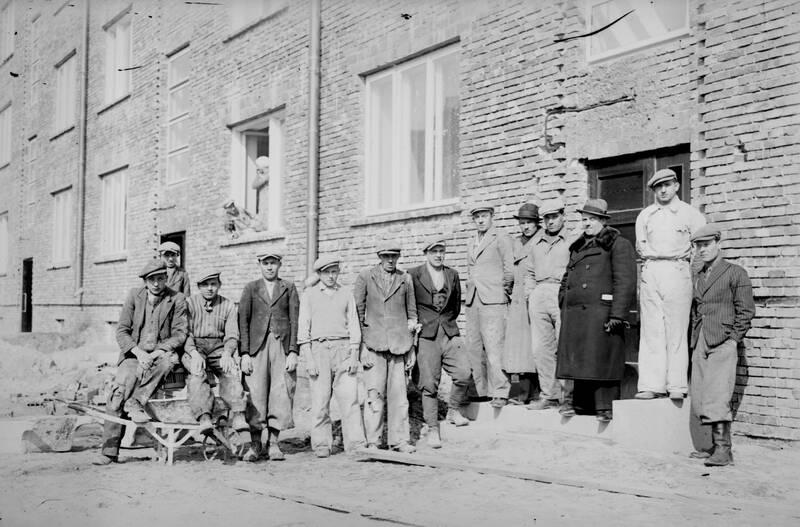 The construction of the housing estate was related to the influx of the workforce to the PZL Airframe Plant No. 2 in Mielec-Cyranka. The new plant needed workers, as well as well-qualified technical and office staff. This resulted in the need to create a housing estate for the plant employees and their families. The design of the urban layout was the responsibility of the construction project management team, lead by Major Piotr Czyżewski, an architect and civil engineer. The plan comprised an area of about 20 hectares. It provided for the construction of a housing estate made of 27 buildings of various types, as well as a director’s villa, two deputy directors’ villas, a social centre, a primary school, a hospital, a church, a sports stadium and a post office. The design was inspired by the natural shape of a sand dune. In its curve, an infrastructural composition was located that resembled a half of a Venetian window. From 1st September 1937 to 1st September 1939 (when World War II began), construction of six CIR-related developments was going on. A military airfield was being built for a new bomber wing. To facilitate test flights, a concrete taxiway was built, as well as the main runway (of hexagonal concrete blocks). In 1939, the foundation for one military hangar was made, and the excavation for the other was completed. Nearby, a company employed by the Construction Department at the Ministry of Military Affairs had gathered construction materials and steel frames for hangar assembly. At the beginning of the Nazi German occupation, the airfield facilities were taken over by the Ministry of Aviation of the Third Reich. As regards the aviation plant facilities, the main production hall was built (for the PZL aircraft), as well as the management building, a plant hangar, the warehouses and the necessary infrastructure of the plant. The plant in Mielec was a branch of the PZL WP-1 Warszawa-Okęcie Airframe Plant. The PZL housing estate comprised 16 multi-residential buildings, a block of flats for specialists, as well as a one-family villa and a semi-detached villa for directors. The design was based on the application of basic square modules (83m x 80m), on which two residential buildings were placed. Each building had 3 floors, as well as a basement with a shelter. The attics contained utility rooms and laundries. The area near the housing estate, across former Kędziora street, was earmarked for levelling for the future allotments, promenades and parks. Amidst the green belt, a hospital and a multi-residential building for the medical personnel were to be built (until September 1939, the hospital buildings had been built, with no finish) as well as a church with a presbytery, and a post office. From 1937 to 1938, a company road connected the estate and the plant. Between the housing estate and the railway line, an excavation was made for the foundations of the Leo plant, manufacturing military shoes. Near the excavation a depot appeared, where the construction materials needed for building the plant were stored. In January 1939, a road connected two towns: Mielec and Kolbuszowa. After the state authorities decided to start manufacturing, under licence, civilian airplanes (for flying clubs) and military ones (for the Polish army – first with piston engines, i.e. the Po-2 or CSS-13 aircraft, then with jet engines, i.e. MiG-15 and MiG-15 bis, under the names of Lim-1 and Lim-2), another decision was made: to expand the housing estate to accommodate the new aviation plant workers. In 1957, the decision was made to transfer the title to the housing estate to the municipal authorities and the Municipal Residential Building Authority was established. Today, the blocks of flats dating from the Central Industrial Region period stand next door to those built after World War II. Their characteristic stairwells have survived, with wooden banister supported by a steel structure, so typical of that period. The vertical glazing of the stairwells is unique, too, although the building elevations are void of any architectural details. 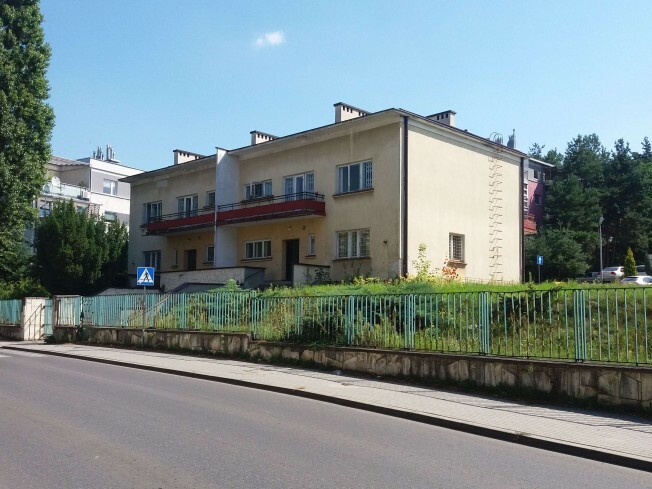 Another item on the Route – currently: at 8 Marii Skłodowskiej-Curie street – is the former block of flats for department managers (today, it houses a county sanitary and epidemiological station). The building contained six flats of a usable area of 130 m2. Each of the flats had 4 rooms, a corridor, a kitchen, a bathroom and a servant room. The rooms located in the outermost section of the flats were arranged as enfilade rooms. The design of the block emphasized symmetry, with the accentuated central entrance part. Little oblong windows were placed there, five rows of which produced a mosaic effect. The lateral façades had two types of windows, but their rhythm and regularity was retained, which produced a visually attractive shape. The whole building was given a clinker base course. Now we move on to the deputy directors’ villa (at 16 Chopina street). This semi-detached house is marked by the connected balconies on its front elevation. Its unassuming visual expressiveness was compensated for by its impressively vast usable area – 220 m2 – and excellent layout. Each of the two residences had its own stairwell, and the two-floor arrangement was subdivided into a day-time and a night sections. Each flat consisted of five rooms, two bathrooms, a kitchen, a servant room, a vestibule and the halls on both floors. Furthermore, there were a garage, a boiler room, a fuel store, and the utility rooms in the basement. In 2015, the authorities of the Mielec county sold the villa. Currently, it is unused (before that, it had been the seat of the County Family Support Centre, which moved to Żeromskiego street). Another site on the Route is the company villa of the general director of the PZL aviation plant in Mielec (at 18 Chopina street). It is considered to be the architectural masterpiece of the whole housing estate. Today, it is the seat of the MARR S.A. Regional Development Agency. It was designed as a detached house. Vast stairs, culminating in an arcade supported by three round pillars, led to the residence. The porch offered entry to two functionally separate sections of the house. The residential part comprised a spacious room and a dining room, which could be accessed from the main hall, together with an enfilade and a garden terrace. The utility section, located on the opposite side of the house, consisted of a kitchen with a pantry, a servant room and a small annexe for the sideboard. The dressing room, the bathroom with a separate toilet, as well as four bedrooms were located upstairs. The usable area was ample indeed – it amounted to 257 m2. The basement contained additional utility rooms and a garage. The central part of the building structure was supported by a reinforced concrete chimney, which held binding joists together. Such a solution made it possible to create space without resorting to pillars or other load-bearing elements. The design and aesthetic quality of this residence stand out from the other residential buildings constructed at the time of the Central Industrial Region. It was designed as a complex of three cuboids merging with one another, whose compositional dominant was the highest part: a glazed corner, whose role was that of wind protection. A unique visual element were the front terrace pergolas. The house has acquired its unique form due to the arcade cut out in its main contour. A worthwhile accent are the bull’s eye windows paired up on the front elevation. The villa was given flat roofs, with small drip moulds. It makes a dynamic impression, which is emphasized by the stairs around the house. The harmony of various elements and the well-thought-out sophisticated design of the façade prove the architectural vision behind the house. It is one of the best achievements of one-family developments within the framework of the CIR project. Today, one of the walls features an exhibition of photographs illustrating the origins and the post-war fate of the villa. 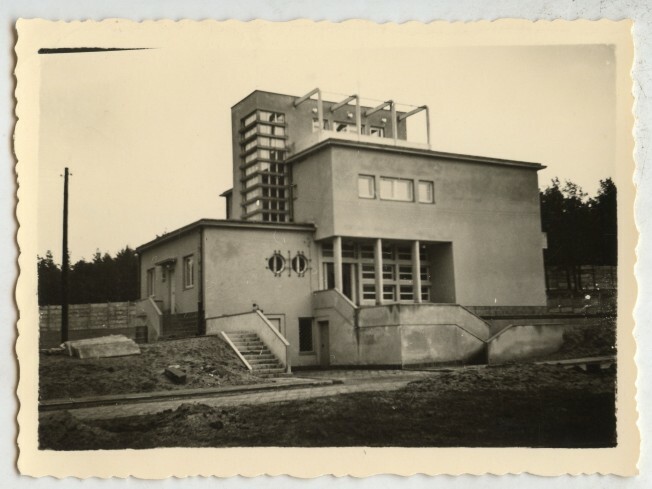 The last item on our Route is the ‘Jadernówka’ Photography Department of the Regional Museum in Mielec, located near the bus and railway stations. To reach it, we go along Niepodległości avenue, cross Torowa street, turn into Jadernych street and get to No. 19. The seat of the museum is a brick house built by the photographer August Jaderny from 1904 to 1906. It was designed by Stanisław Bronisławski as a ground-floor only building, with one utility room in the attic. The photography atelier of the Jaderny family was open in the this house for nearly 80 years. Since 1987, it has been a museum. 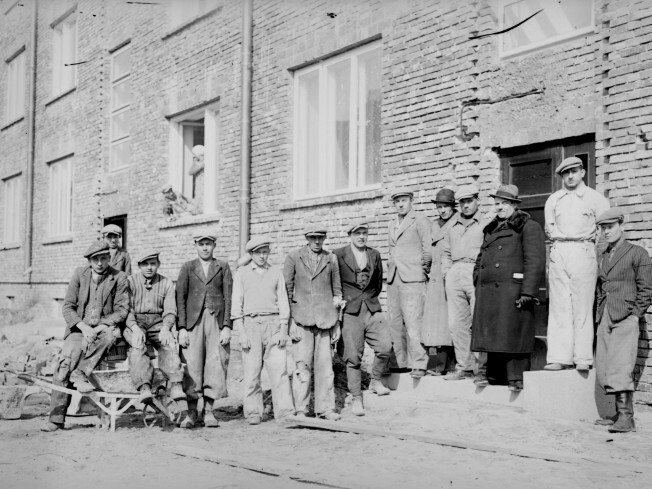 Some photographs exhibited have captured Mielec in the years when the Central Industrial Region was built. Apart from a collection of photographs, the museum in the former Jaderny atelier offers also ‘museum lessons’. Famous for its unique collection of old cameras, it boasts more than 40 thousand exhibits, such as photographs, negatives, nearly 300 historical cameras, stands, flash guns, light meters, darkroom and laboratory equipment, enlargers, glass plate boxes, film cameras, projectors, as well as photography-oriented magazines and publications. This theme collection is especially worth visiting. After leaving the museum, we head for the bus station at Kazimierza Jagiellończyka street (near Niepodległości street) or the railway station (near Głowackiego street).